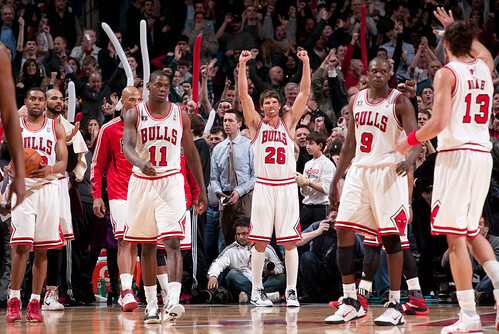 On the day the Bulls didn’t do anything they did something special and impressive. The Bulls Thursday in defeating the Miami Heat 93-89 outplayed the Heat, especially down the stretch, muscled them and made them back off, LeBron James closing the game with a wild three that missed and Chris Bosh retreating to a one of 18 shooting night as he inched farther and farther from contact. The Bulls moved to 39-17 and within two games of both Miami and Boston in the East with the season tiebreaker over the Heat. And the Bulls did it not only with another superb game from Derrick Rose, who outdueled James down the stretch in the battle likely for this season’s MVP award, but the Bulls got big shots from Luol Deng and Kyle Korver in the closing minutes and a dominant, hustling performance from the team’s reserves. It was the last day of the regular season to make trades in the NBA, and the Bulls decided they might be just good enough as comprised. For Thursday they were. “Just letting people know we can compete with some of the best teams in the NBA,” said Rose, who had 26 points, including two big scores after James had switched on him down the stretch and a pass for the Deng three with 16 seconds left that effectively won the game. 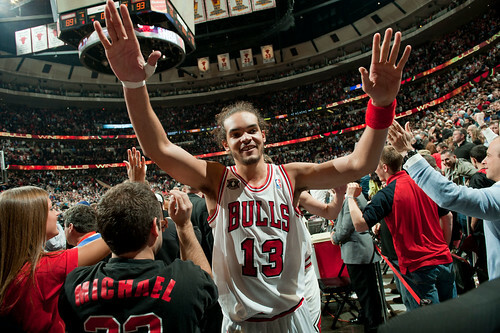 “We’ve got Joakim (Noah) back. His energy was great. When he gets it going we’re going to be tough. When we beat them the first time (in January), people were saying, ‘OK, you beat them, but LeBron wasn’t playing.’ Tonight they had their whole team. It was a tough game, but we pulled it out. 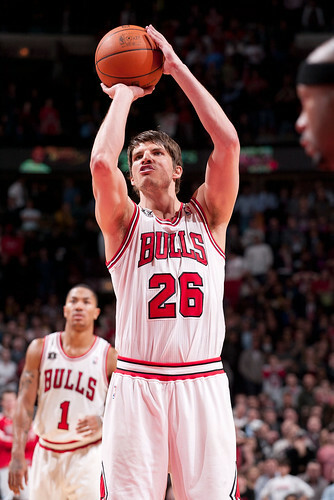 The Bulls did, and you know in a four-point game a shot here or there can make the difference. But Miami is 1-7 against the top teams in the league, seemingly for a reason. It’s not to say they aren’t a quality team as Dwyane Wade had 34 points and James 29 points and 10 rebounds. But the blueprint for playing them is fairly obvious, and the Bulls followed it except for a brutal first quarter when Miami took a 31-23 lead against some quick shots and poor defensive rotations. The Heat ran out for 16 fast break points and two powerful dunks from James, one over his head as he cruised past the basket. That is the first tenet of playing the Heat: Don’t let them get in transition. Easier said than done, of course. But it is a team more than perhaps any in the NBA you need to know what is a good shot, meaning one you can play defense out of. Making sure you have court balance, that you can get back and not give up an easy rebound, playing a bit more carefully than recklessly. Indeed, the Bulls like to get in transition because they have difficulty as a half court scoring team and need easy baskets. 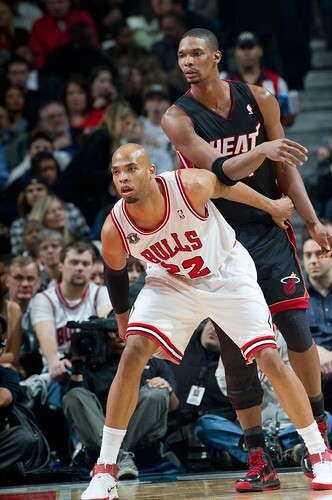 But you don’t want to do so against Miami with James and Wade on the wings, arguably the best such duo in the NBA. Because without transition, it is not a particularly skilled Heat team. They have no point guard, so there is limited ball movement. They had just 12 assists on 32 field goals with James playing a point guard type position most of the time. They get into a lot of one on one isolations, and if you squeeze the lane and pack the paint, as the Bulls were able to do once they got the fast breaks in control, Miami needs to beat you with jump shots. Plus, they are not a very big team or tough. The Bulls pounded them on the boards 53-39 as Bosh, whom Shaq calls the Ru Paul of big men, kept putting up jumper after jumper despite being on the way to the league’s worst shooting game in decades. The plan is to bang him and he’ll retreat. Perhaps it’s just me, but I do notice James rarely ever mentions Bosh but talks about he and Wade. Of course, if Boozer were one for 10, I’m quite sure either he wouldn’t be playing anymore, or he would be going to the basket and be done with the jump shots. I’d say a good signal might be when you are one of 16. 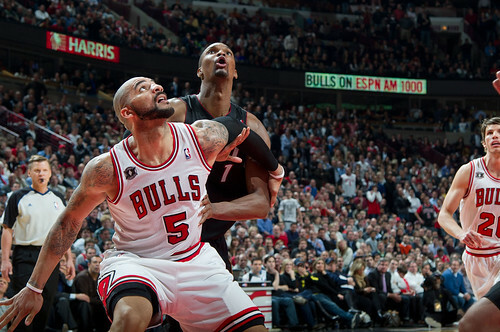 So after Boozer, who had a solid 16 points and nine rebounds with some hard post moves against Bosh, jumps in the air and finds Korver, who’s screaming ‘Booz!,’ the Bulls are trailing 84-83 after they’d kicked away a nine point fourth quarter lead. Bosh takes a 22 footer. Brick! Miss! 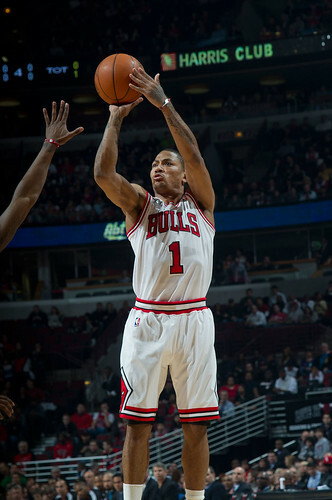 Rose then shoots one a bit hard off the backboard and it rolls off the rim on a drive. James misses a three as Miami was two of 12 from there. And Rose then just gets sick of the bumping and fights through the Miami defense—which is pretty good—and two hands a ball into the basket with the kind of strength you never see from a point guard: 85-84 Bulls with 2:49 left. Mario Chalmers then commits an offensive foul and Deng jumps hard into a pull up and swishes it with 2:05 left for an 87-84 Bulls lead. The Bulls soon would even more. So with the Bulls up three and under two minutes left, Bosh pulled up and bricked a 19 footer. 1. 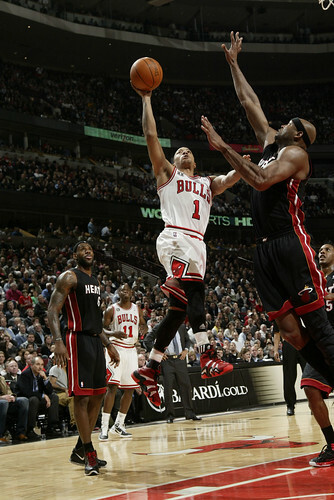 James was on Rose and not doing much to stop the scoring, though he was trying. But Rose was too quick. They are the consensus top choices for MVP, and this and the next Bulls game with Miami, a Sunday March 6th national TV game could play a big part in the vote. 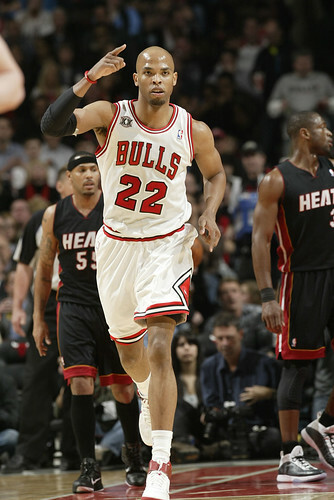 Rose likely got the edge from Thursday’s national TNT game. 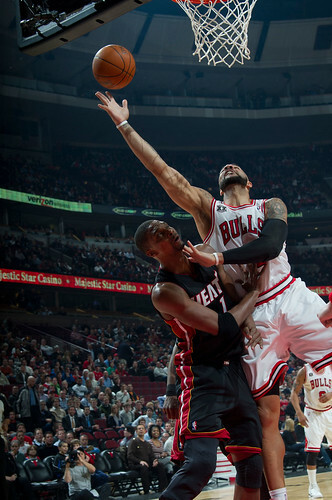 Deng got the ball back to Rose, who circled right with Wade picking Rose up on a switch. 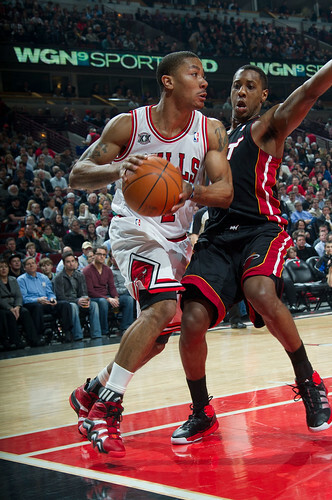 With Wade pushing up, Rose let go from 22 feet and made it for an 89-84 lead with 1:06 left. The usually dispassionate Rose screamed toward the crowd with some words he said he was too embarrassed to repeat and skipped toward the bench past singer and provocateur Kanye West, who likely ranted to himself that he wasn’t talented enough to be in the same venue with someone like Rose. Or even Taylor Swift. Wade then came out of a timeout and got a screen high from Bosh and went to the baseline and hit a fade that hit the rim and bounced up and in with 59 seconds to get Miami within 89-86. James played Rose hard on the inbounds and Noah finally set a screen to get him the ball, but Rose missed a pullup elbow 20 footer. Bosh rebounded and outletted to James, who drove it back, making a short runner and was fouled by Rose for a basket and three point play to tie the game at 89 with 36.8 seconds left. Don’t discount them. They are a good team and don’t go down easily. If they get out in transition, there really is no one better. Rose went up in the air, but passed to Deng in the corner and Deng’s three settled gently in the basket as the crowd exploded not so gently, Deng posing and holding his extension and then exchanging chest bumps with Rose. Curiously, the Heat came out of the timeout with seemingly plenty of time and James took a rushed three from the top of the circle and missed he rim. 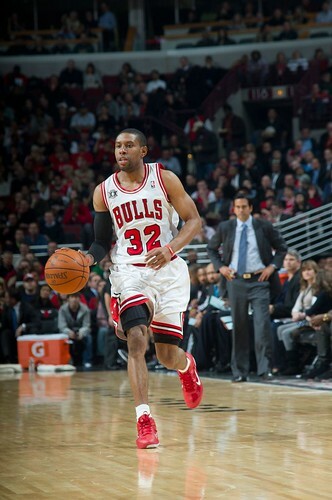 Rose rebounded. The Bulls had to inbound and got it in to Korver, who made one of two and Wade missed a last jumper as the Heat walked off with a second consecutive loss in the United Center. 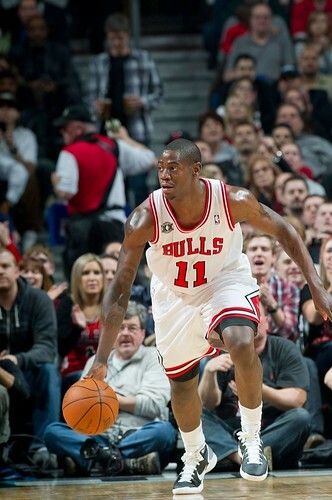 Such was the change from Wednesday in Toronto when the Bulls defense was passive and they lost. It looked similar early Thursday as Miami led 53-44 in the first half. 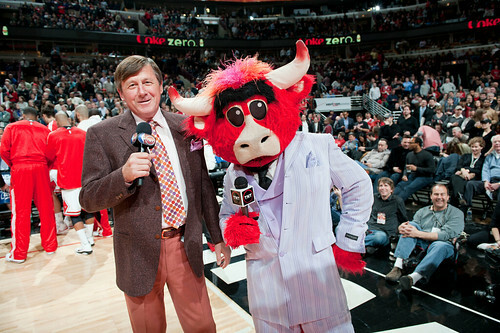 The Bulls got a boost in that quarter with Omer Asik playing for Kurt Thomas in what Thibodeau said was a case of matchup but which should be regular occurrence. It’s clear Thomas is somewhat gassed from all his playing time thus far, and Asik’s energy, rebounding and defensive hustle (he probably helps better than any big man) was crucial Thursday as he had a game high 11 rebounds in just 21 minutes. 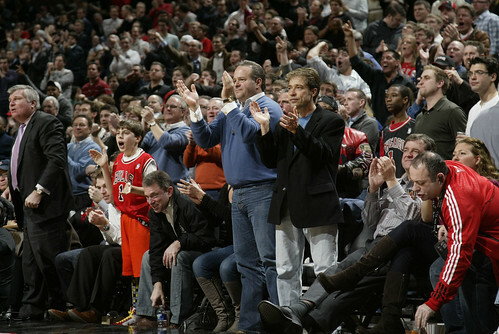 Even Thibodeau agreed, “Omer was great. That group held off the Heat mostly against their starters in the second quarter as the Heat bench is atrocious, and the Bulls crushed Miami with a dominant third quarter as Rose had a dozen and Deng 10. 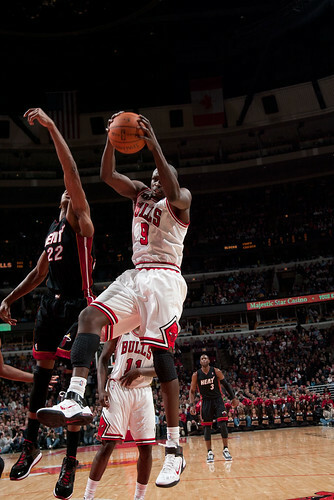 Deng, especially, made big plays on hard drives and run outs, his five rebounds matching the Heat’s quarter total as the Bulls had 16 overall. Deng said it’s just been such a different season for him as in the past after a poor half with just two points he’d come out searching for points and take bad shots. Yes, a part is chemistry, so hard to define or recognize at times, and part is size and toughness as the Bulls got up 80-71 and then saw Miami score 13 straight to lead 84-80 before that Korver three on the pass from Boozer that got the Bulls headed back and toward victory. Against the Heat it did on Thursday as well. 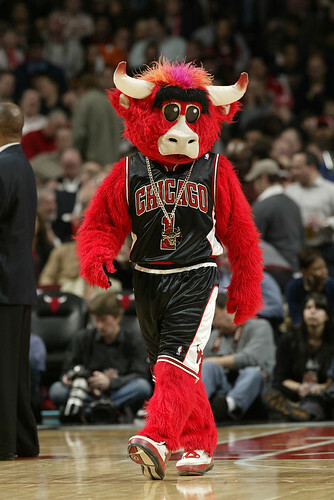 And come playoff time the Bulls likely will see them again. It was a good start toward that.